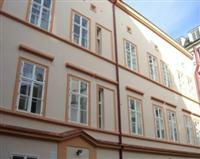 Residence Apartments Pinkas are superb located right in the very centre of Prague 1 in the historical Old Town. It is short walk to the National Theatre and Laterna Magica, Old Town Square, Wenceslas Square or Charles Bridge. DistanceMetro / Tram 3 minNational Theatre 4 minOld Town 5 minWenceslas Square 10 minCharles Bridge 10 minThere is famous oldest working restaurant in Prague called U Fleku located in the same street as the apartments are.